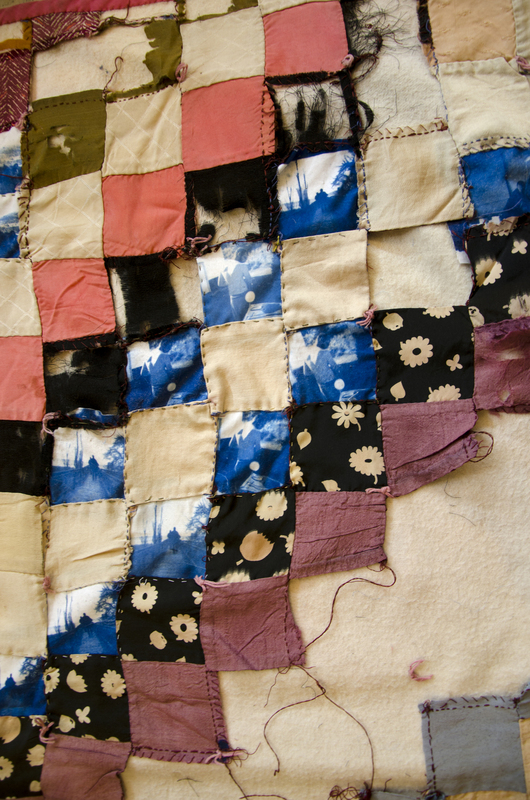 This quilt I repaired for you. And for me. I share the moments we do not experience together to hold you as a witness to my story. Life is building relations and nurturing those connections with others. You are here with me, looking into my past as we create new fetters. The tiny flashes of an instant I can only convey in fragmented, often blurry recollection, bind us together, as I have stitched them together. Like your memory, all memory is not perfect. Recalling and retelling is an approximation of the past, with each utterance of an experience forever different then the first or last retelling. The same moment is replicated multiple times to create a more complete picture. Iteration helps memory but also changes the details of what was thought to be accurate. With the repetition of a moment we can begin to tell the story. A shadow in a door frame, a lover in bed, vistas with bones. My story is but one version of a life, A visual approximation of varied observations.